All steel construction which is more hygienic and easier for cleaning. 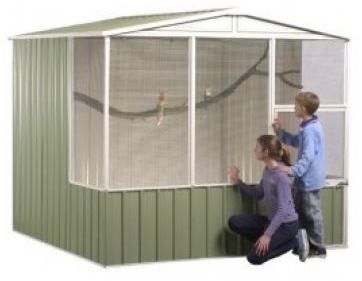 Features include: *Wider Mesh panels for better viewing *Standard mesh is 12.5mm sq x 1.3mm thick *Can be used as dog kennels, catteries, hen houses or animal shelters. We offer the complete package from laying the concrete slab to the full erection of your new aviary.